As we know that Wildcard SSL is a much-needed SSL certificate for those organizations who run their business on various sub-domains. 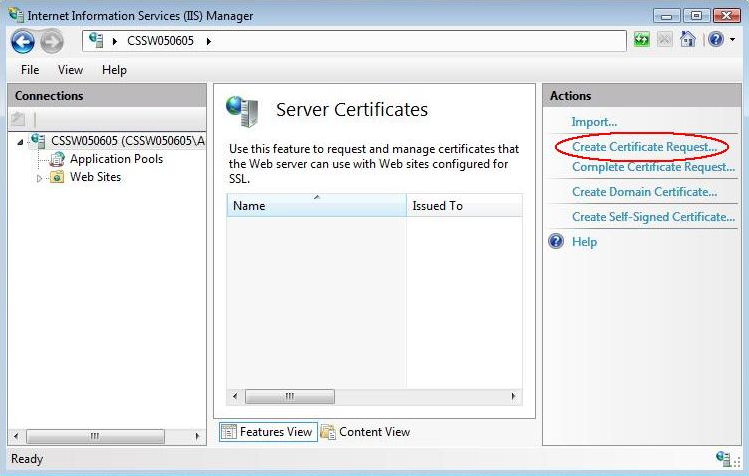 Installation of Wildcard Certificate on IIS 7 requires a specific process, which should be completed with extra care. However, before the installation of SSL certificate on server like Microsoft’s IIS 7, you should have better knowledge of generating CSR for SSL certificate. In this piece of information, we would like to make you aware about to generate CSR for Wildcard SSL certificate in IIS 7. Let’s know about CSR before generating CSR for SSL certificate. Comodo Wildcard certificate – Secure unlimited sub domains under a single FQDN with discount price. 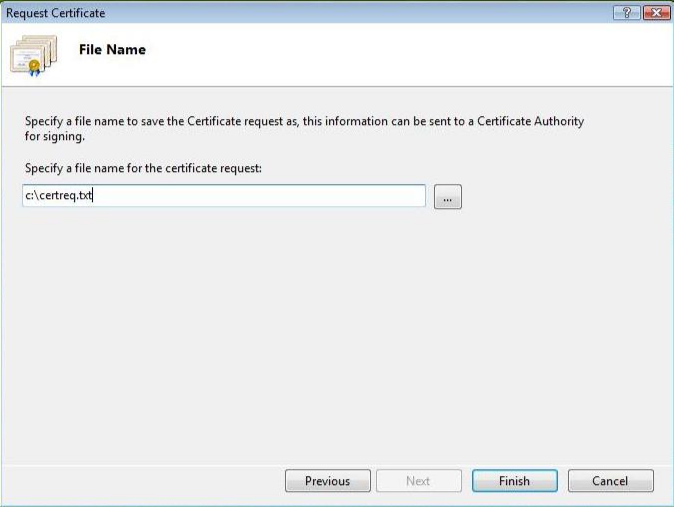 Certificate authority needs information to verify the applicant before issuing certificate. In Public Key Infrastructure (PKI), an applicant provides CSR (Certificate Signing Request) to the certificate provider to get a digital identity certificate. The CSR contains public key and private key, which should be generated by the applicant. 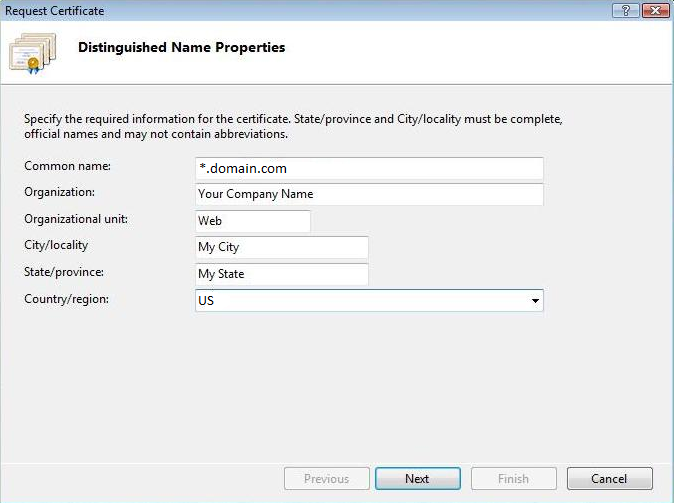 The CSR must occupy the information required by the certificate authority: Distinguished name, Business name, Town, Department name, country, region, generic email address. To identify the server name for which a certificate request is made, the CSR also includes fully qualified host name of the server. To verify the CSR, an applicant must provide the hostname and key size. According to latest encryption standard, the length of CSR key is 2048-bit or higher. Here, we have enumerated the CSR generation for the installation of Wildcard SSL on IIS 7. IIS is an internet information server created by Microsoft for the use of window. It supports HTTP, HTTPS, FTP, SMTP, and NNTP. It carries request filter, which rejects suspicious URL and thus reduce the attack. 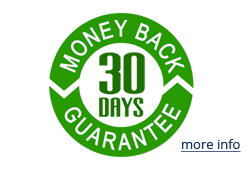 As we know, SSL certificates are most trusted certificate all over the world. 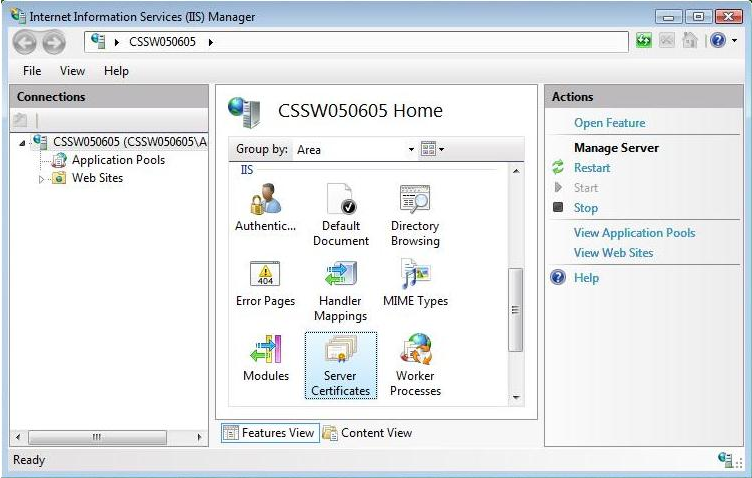 Open Internet Information Services (IIS) Manager and click on the name of the server in the connections column on the left and double-click on “Server Certificates”. Go to the right in the Actions column, click on “Create Certificate Request”. Enter all of the subsequent information about your company and the domain you are securing and then click “Next”. 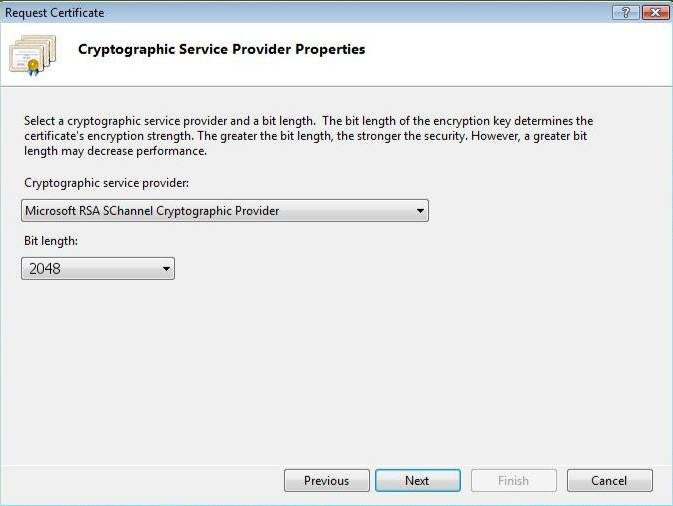 Allow the default Cryptographic Service Provider. Rise the Bit length to 2048 bit or higher. Click Next. Browse the filename to save the request certificate and click Finish. You will require that contents of this file to enroll an SSL Certificate. Now, you have certificate signing request (CSR). Choose your SSL Certificate and provide company information to verify your identity. Comodo Positive SSL Wildcard Domain $97.50 /yr. $229.00 /yr. RapidSSL Wildcard Domain $103.05/yr. $174.00/yr. Comodo Positive Multi-Domain Wildcard SSL Domain $165.00 /yr. $349.00 /yr. Thawte Wildcard SSL Domain & Basic Organization $274.50/yr. $524.50/yr. GeoTrust True BusinessID Wildcard Domain & Basic Organization $341.10/yr. $436.50/yr. The certificate request process varies by Certificate Authority. Now, open the .txt file which contains the certificate request. Copy the encrypted certificate request and paste it in the appropriate field on the order form. When you fulfill the certificate request form and endow with payment, please check your email to get an SSL Certificate that delivered by certificate provider. After generating your CSR, you will receive the certificate from certificate vendor. Now you can proceed to install your certificate. Our next article will explain in detail How to Install Wildcard SSL Certificate in IIS 7.